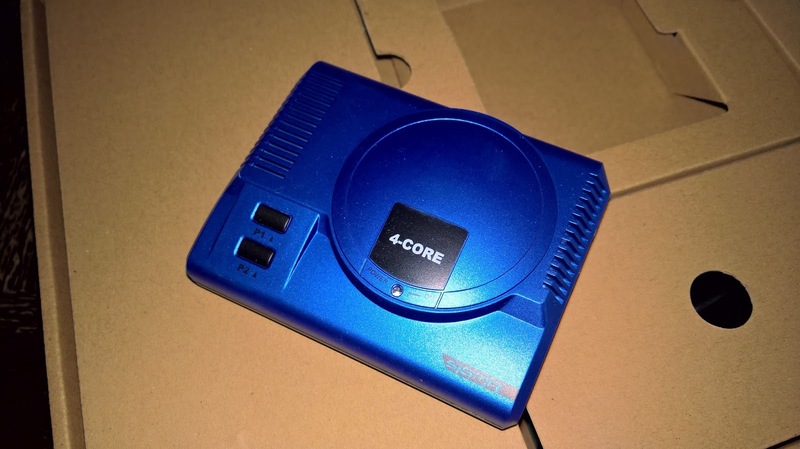 I've bought a few books via crowdfunding, but I've never purchased any hardware until I saw the RetroEngine Sigma back in December. 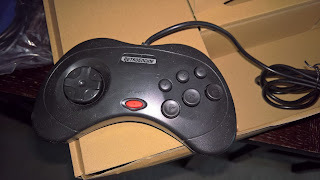 It promised a "plug-and-play" experience with several video game emulators. It comes pre-installed with a few of its own licensed games, but you'd have to provide your own ROMs (a gray area, of course). I was most interested in emulators for the Sega Genesis, Sega CD, Sega 32X, Game Gear, Super Nintendo, NES, and N64. I owned an NES and a Sega Genesis/Sega CD. I almost bought a 32X when it was on clearance thanks to Sega's botched long-term plan that saw the 32X and Sega Saturn released just months apart. 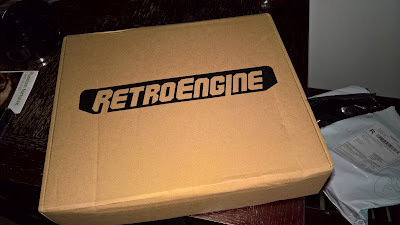 The RetroEngine has several other emulators, too, like the Atari 2600, Gameboy, TurboGrafx, Neo Geo, Intellivision, and Sony PlayStation. I'd looked into getting a Raspberry Pi and making my own emulation box, but this sounded like a less labor-intensive product. The units were supposed to ship in June, but I didn't get mine until August 14 due to production delays, according to Doyodo, the company that ran the campaign on Indiegogo. I wasn't happy about the delays, and neither were the other backers of the project. When units finally started shipping, the comments didn't look good. Most people appeared to have problems with their units, with the biggest problem being a Wi-Fi error. Some backers couldn't get their units to boot up out of the box, which was a troubling proposition. The RetroEngine box isn't anything special. Not glossy, not flashy. It's just a cardboard box with the logo. This is everything that came in the box: the system, two controllers, an HDMI cable, a power adapter, and a bag containing the MicroSD card, MicroSD card reader, Bluetooth dongle. 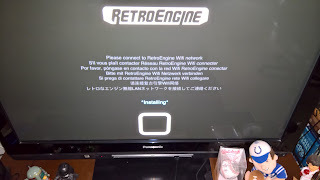 To set up the RetroEngine, you're supposed to connect the unit to your home Wi-Fi via a phone, tablet, or computer. 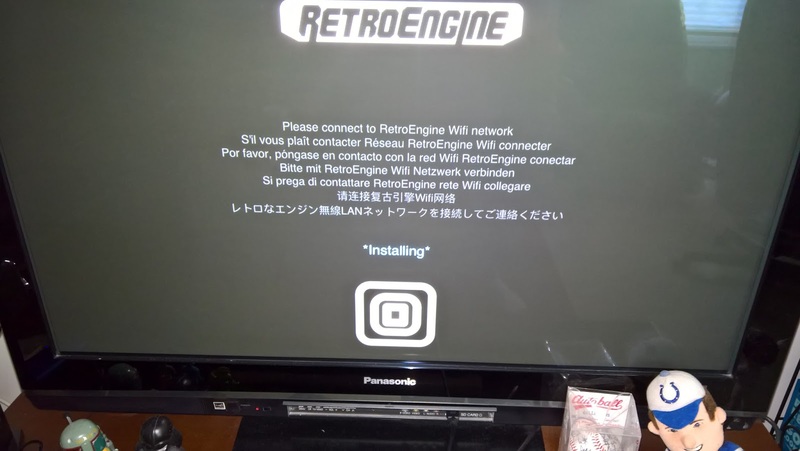 The included "quick start" guide wasn't very helpful in that regard, so I went to the RetroEngine website and followed the steps. My unit booted fine and I saw the initialization screen. However, the screen stayed up for much too long (about 30 minutes) and I restarted the unit. After that, it booted. 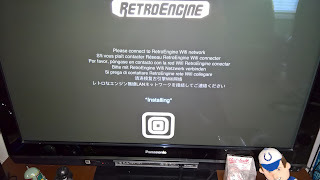 I was able to connect it to my Wi-Fi using my Microsoft Surface and selected the option to install the emulators, which weren't pre-installed on the 32GB MicroSD card that came with the RetroEngine. My first impression of the unit was favorable. It was packed well and everything came wrapped accordingly. 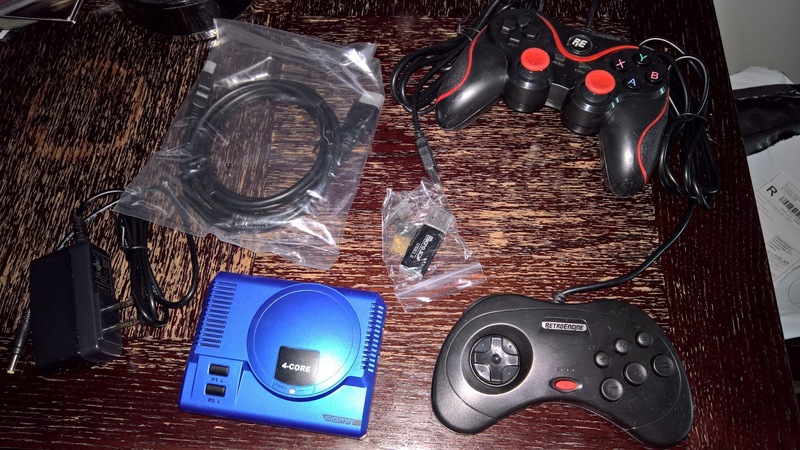 I didn't find any loose parts or SD cards, which was a problem other backers experienced. 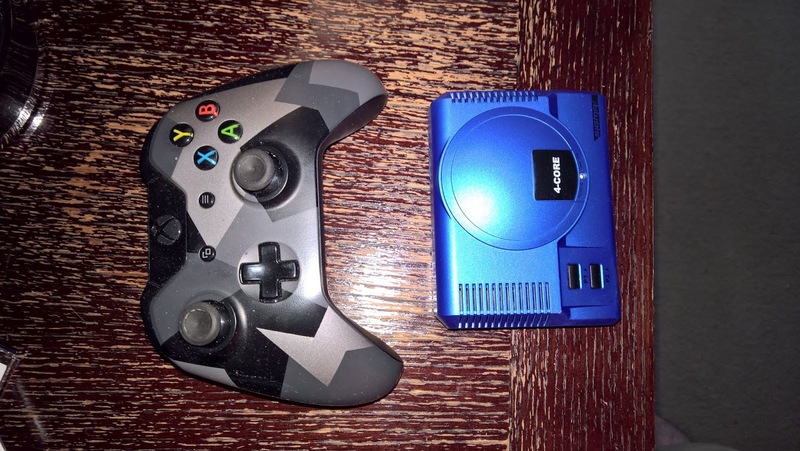 The unit is tiny--even smaller than an Xbox One controller! The unit isn't very big at all. The perk I ordered comes with two controllers: the default Dual Shock-like RetroEngine controller and a six-button Genesis/Saturn-style controller. 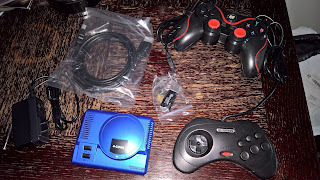 The RetroEngine controller feels just okay (has just a little bit of heft...a little) and the other one feels pretty darn cheap (it's super, super light). I'm not really sold on either controller, to be honest, but I'm glad they give me something to tinker with. This controller feels okay. I'll probably get a better one somewhere down the line. 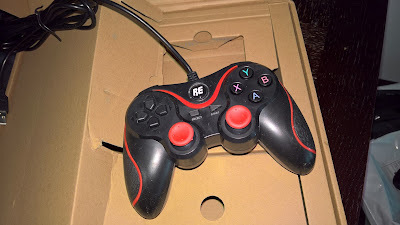 This controller feels very cheaply made. I think it'll break if I try to use it. We'll see. I had my choice of a silver shell or a blue shell; I opted for the blue one. I thought it would be a more metallic blue, but it's pretty much just blue. 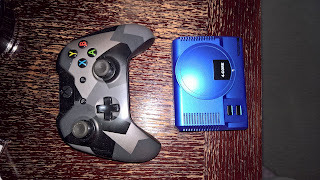 As you can see, it resembles a (non-copyright-infringing) blue mini-Sega Genesis. Maybe that's why I was attracted to the product in the first place! The resemblance to the Sega Genesis/Mega Drive is no coincidence, I think. Installation started at 1:55 p.m. on Monday, August 14. I kept thinking it would get everything loaded within a few hours, but by the time I went to bed at 9:55 p.m., I still saw the loading screen. When I got up for work in the morning at 3 a.m. Tuesday, the unit had finished loading the different emulators. ...you're going to see it for a long time. My biggest complaint about the product is that it's not, in any way, a "plug-and-play" device. Setup worked for me, but it hasn't worked for others. The emulators have to be downloaded, which took several hours. That wouldn't be a problem if Doyodo didn't claim it would be ready to play pretty much when you took it out of the box. This was supposed to be "emulation made easy," but it's basically just like any Pi 3/RetroPie kit you can buy on Amazon or eBay. Those kits, by the way, include a more powerful board (the RetroEngine is an Orange Pi Lite board) and cost about the same or are cheaper. I was intimidated by the assembly and setup process, but I think I could've pulled it off after taking a closer look at it. That said, I did have some different ROMs for a few systems, and they worked fine. I put my Genesis games in the Genesis folder, but they weren't recognized. I had to move them to the Mega Drive folder, which made me feel so European. SNES and Sega 32X games worked great as well. It wasn't perfect, though. The N64 games wouldn't load; one of the default emulators simply froze while the other would load the game to a black screen and let you dump out of the game. The pre-installed arcade games included "BurgerTime" and "Lock 'n' Chase," and while they played, they didn't have sound! The system is also supposed to "scrape" metadata for games so they display nicely, but I'm having mixed results with that. Some of it, I think, has to do with how my ROM files are named, so maybe some light editing will help with that. So I have to reiterate: it's not quite the easy-to-use product I'd hoped for. Several other RetroEngine owners have suggested getting a better quality MicroSD card and flashing RetrOrangePi to get rid of the buggy RetroEngine UI. I may get a new SD card and give that a try. After all, the RetroSigma OS is basically just a splashscreen on top of the RetrOrangePi interface anyway. May as well just cut the fat from the equation. I'm wondering if that will help the N64 emulator run more smoothly. So, I've still been writing!